The IL3122-3E low cost passive input RS-422 isolated transceiver from NVE is designed to galvanically isolate bidirectional data communication over balanced transmission lines. The IL3122 series delivers at least 1.5V into a 54Ω load for excellent data integrity over long cables, and is also compatible with 3V input supplies, allowing interfacing to standard microcontrollers without additional level shifting. A unique ceramic/polymer composite barrier provides excellent isolation and virtually unlimited barrier life. This particular device uses NVE’s patented IsoLoop spintronic Giant Magnetoresistance (GMR) technology and comes in a 0.15" 16-pin SOIC package. The IL3122E low cost passive input RS-422 isolated transceiver from NVE is designed to galvanically isolate bidirectional data communication over balanced transmission lines. The IL3122 series delivers at least 1.5V into a 54Ω load for excellent data integrity over long cables, and is also compatible with 3V input supplies, allowing interfacing to standard microcontrollers without additional level shifting. A unique ceramic/polymer composite barrier provides excellent isolation and virtually unlimited barrier life. This particular device uses NVE’s patented IsoLoop spintronic Giant Magnetoresistance (GMR) technology and comes in a 0.3" 16-pin SOIC package. The IL3185E low cost passive input RS-485 isolated transceiver from NVE is designed to galvanically isolate bidirectional data communication over balanced transmission lines. The IL3185 series delivers at least 1.5V into a 54Ω load for excellent data integrity over long cables, and is also compatible with 3V input supplies, allowing interfacing to standard microcontrollers without additional level shifting. A unique ceramic/polymer composite barrier provides excellent isolation and virtually unlimited barrier life. This particular device uses NVE’s patented IsoLoop spintronic Giant Magnetoresistance (GMR) technology and comes in a 0.3" 16-pin SOIC package. The IL3285-3E fractional load passive input RS-485 isolated transceiver from NVE is designed to galvanically isolate bidirectional data communication over balanced transmission lines. The IL3285 series delivers at least 1.5V into a 54Ω load for excellent data integrity over long cables, and is also compatible with 3V input supplies, allowing interfacing to standard microcontrollers without additional level shifting. A unique ceramic/polymer composite barrier provides excellent isolation and virtually unlimited barrier life. This particular device uses NVE’s patented IsoLoop spintronic Giant Magnetoresistance (GMR) technology and comes in a 0.15" 16-pin SOIC package. The IL3285E fractional load passive input RS-485 isolated transceiver from NVE is designed to galvanically isolate bidirectional data communication over balanced transmission lines. The IL3285 series delivers at least 1.5V into a 54Ω load for excellent data integrity over long cables, and is also compatible with 3V input supplies, allowing interfacing to standard microcontrollers without additional level shifting. A unique ceramic/polymer composite barrier provides excellent isolation and virtually unlimited barrier life. This particular device uses NVE’s patented IsoLoop spintronic Giant Magnetoresistance (GMR) technology and comes in a 0.3" 16-pin SOIC package. The IL3422-3E high speed passive input RS-422 isolated transceiver from NVE is designed to galvanically isolate bidirectional data communication over balanced transmission lines. The IL3422 delivers at least 2V into a 100Ω load for excellent data integrity over long cables, and is also compatible with 3.3 V input supplies, allowing interfacing to standard microcontrollers without additional level shifting. A unique ceramic/polymer composite barrier provides excellent isolation and virtually unlimited barrier life. This particular device uses NVE’s patented IsoLoop spintronic Giant Magnetoresistance (GMR) technology and comes in a 0.15" 16-pin SOIC package. The IL3422E high speed passive input RS-422 isolated transceiver from NVE is designed to galvanically isolate bidirectional data communication over balanced transmission lines. The IL3422 series delivers at least 2V into a 100Ω load for excellent data integrity over long cables, and is also compatible with 3V input supplies, allowing interfacing to standard microcontrollers without additional level shifting. A unique ceramic/polymer composite barrier provides excellent isolation and virtually unlimited barrier life. This particular device uses NVE’s patented IsoLoop spintronic Giant Magnetoresistance (GMR) technology and comes in a 0.3" 16-pin SOIC package. The IL3485-3E high speed passive input RS-485 isolated transceiver from NVE is designed to galvanically isolate bidirectional data communication over balanced transmission lines. The IL3485 series delivers at least 1.5V into a 54Ω load for excellent data integrity over long cables, and is also compatible with 3V input supplies, allowing interfacing to standard microcontrollers without additional level shifting. A unique ceramic/polymer composite barrier provides excellent isolation and virtually unlimited barrier life. This particular device uses NVE’s patented IsoLoop spintronic Giant Magnetoresistance (GMR) technology and comes in a 0.15" 16-pin SOIC package. The IL3485E high speed passive input RS-485 isolated transceiver from NVE is designed to galvanically isolate bidirectional data communication over balanced transmission lines. The IL3485 series delivers at least 1.5V into a 54Ω load for excellent data integrity over long cables, and is also compatible with 3V input supplies, allowing interfacing to standard microcontrollers without additional level shifting. A unique ceramic/polymer composite barrier provides excellent isolation and virtually unlimited barrier life. This particular device uses NVE’s patented IsoLoop spintronic Giant Magnetoresistance (GMR) technology and comes in a 0.3" 16-pin SOIC package. The IL3522E high speed differential input RS-422 isolated transceiver from NVE is designed to galvanically isolate bidirectional data communication over balanced transmission lines. 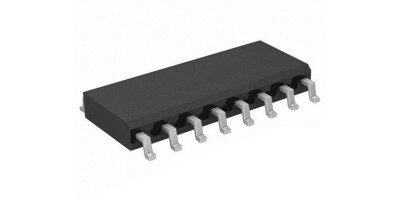 The IL3522 series delivers at least 2.3V into a 54Ω load for excellent data integrity over long cables, and is also compatible with 3V input supplies, allowing interfacing to standard microcontrollers without additional level shifting. A unique ceramic/polymer composite barrier provides excellent isolation and virtually unlimited barrier life. This particular device uses NVE’s patented IsoLoop spintronic Giant Magnetoresistance (GMR) technology and comes in a 0.3" 16-pin SOIC package. The IL610-1E passive input digital isolator from NVE is a single channel signal coupler with flexible, wide range of input voltage and CMOS output. This isolator features data rate of 100Mbps, working voltage of 150VRMS and endures high voltage of 1kVrms/1.5kVdc. The IL610-1E is available in an 8-pin MSOP package, specified over a temperature range of −40°C to +85°C. The IL610 series from NVE are a passive input digital isolator CMOS devices manufactured with NVE’s patented IsoLoop® spintronic Giant Magnetoresistive (GMR) technology. They have a similar interface but better performance than optocouplers, featuring a higher package density and functioning over a wide range of data ranges, edge speeds and power supply levels. A unique ceramic/polymer composite barrier provides excellent isolation and virtually unlimited barrier life. The IL610 series, including IL610-1E is UL1577 recognised and certified to IEC 60747-5-5 (VDE 0884). The IL610-2E passive input digital isolator from NVE is a single channel signal coupler with flexible, wide range of input voltage and CMOS output. This isolator features data rate of 100Mbps, working voltage of 300VRMS and endures high voltage of 1kVrms/1.5kVdc. The IL610-2E is available in an 8-pin PDIP package, specified over a temperature range of −40°C to +85°C. The IL610 series from NVE are a passive input digital isolator CMOS devices manufactured with NVE’s patented IsoLoop® spintronic Giant Magnetoresistive (GMR) technology. They have a similar interface but better performance than optocouplers, featuring a higher package density and functioning over a wide range of data ranges, edge speeds and power supply levels. A unique ceramic/polymer composite barrier provides excellent isolation and virtually unlimited barrier life. The IL610 series, including IL610-2E is UL1577 recognised and certified to IEC 60747-5-5 (VDE 0884).